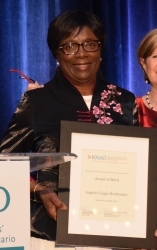 This award recognizes an RN who has made an outstanding contribution to RNAO and to the profession of nursing in Ontario. Winners demonstrate responsibility for professional development and are exemplary role models and mentors to peers. Angela Cooper Brathwaite has never shied away from the responsibility of being a role model. As an administrator in public health and other clinical settings, her supportive management style empowers nurses by making them part of the decision-making process. Angela is an instructor at multiple universities and achieved her PhD in nursing in 2004. She is one of few educators who accompany students at the bedside to demonstrate nursing assessments and ensure they get things right. "I try to be a role model in the classroom, at the bedside, and in management meetings," she says. A deep desire to help people, and to advocate for those in need, led Angela into nursing. Her career has taken her from Trinidad and across three Canadian provinces. Her mother was a nurse, so she grew up in the profession and continues to grow along with nursing. Angela says RNAO membership has helped that growth by supporting her advocacy, and pushing the profession forward. Asked about her legacy, Angela's answer is simple: "I would like to be remembered for helping people achieve their full potential."